D’Artacan and Juliet evade their pursuers, and D’Artacan learns a little of Juliet’s secret mission. They are then separated again by one of Milady’s tricks. 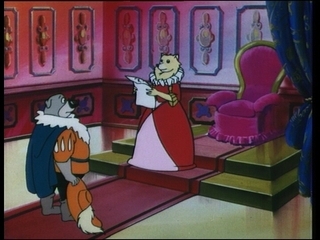 D’Artacan receives a letter from Widimer, falsely claiming that he is holding Juliet. M. De Treville warns D’Artacan not to get involved but, naturally, he does. A skirmish between D’Artacan and his Muskehound friends on the one hand, and Widimer and the Guards on the other, is only broken up when M. De Treville hints to Richelieu that he knows what is going on.